Of course I wanted to make it extra special so I did add a few touches to warrant the occasion. 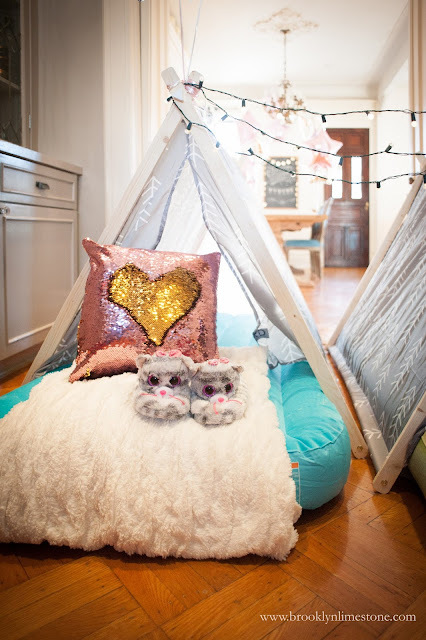 Furry sleeping mask invites, DIY lip balm making, a killer cake and tents with twinkle lights. 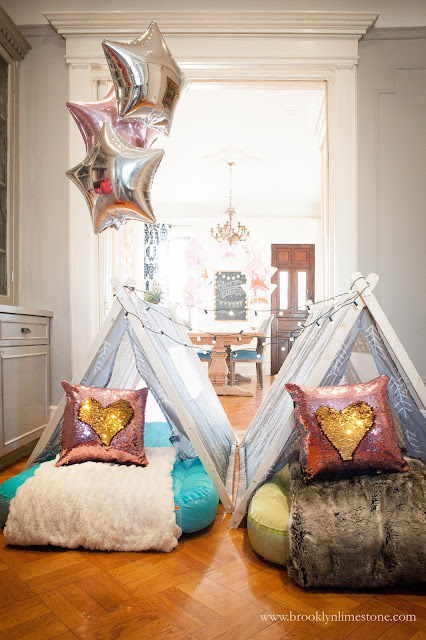 We set up four sleeping tents inside the house so the girls would get to all sleep together but have their own space. The DIY lip balm kits were a big hit with the kids carefully selecting their scents and patiently waiting for it to harden. 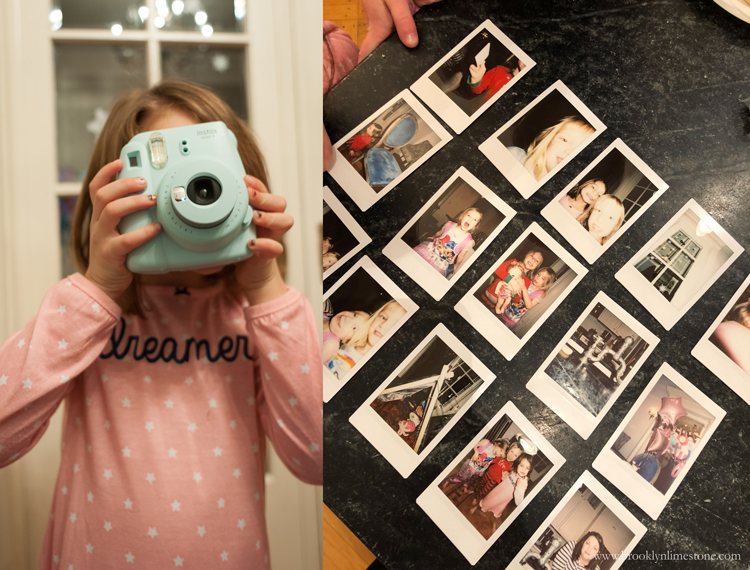 Another huge hit was an Instax camera (kind of like an old Polaroid) one of the girls gave Aggie as a gift - they all loved taking turns and photographing each other (and me, and the faucet and the chair, etc) After pizza and cake and lots of running around it was time to settle in for a movie before bedtime. Much to my shock, they all hit the hay and actually slept like logs until the next morning. The kids had a blast and it was relatively easy to put together so a win on both counts. I'll definitely be doing this again if she lets me. Will you adopt me, please? 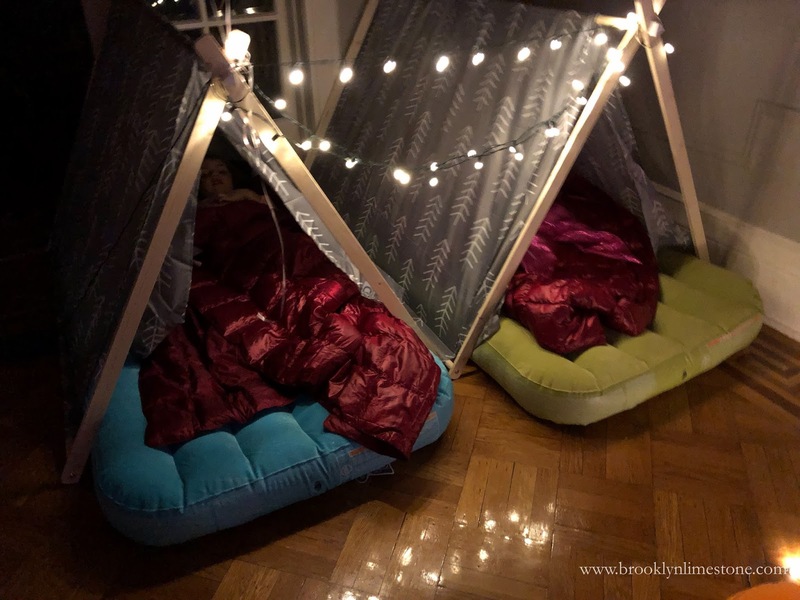 I am a birthday party veteran (three teens) and came up with the perfect formula (much easier and less time than a slumber party, which may seem like it is easier but definitely takes more time and attention since kids stay overnight. 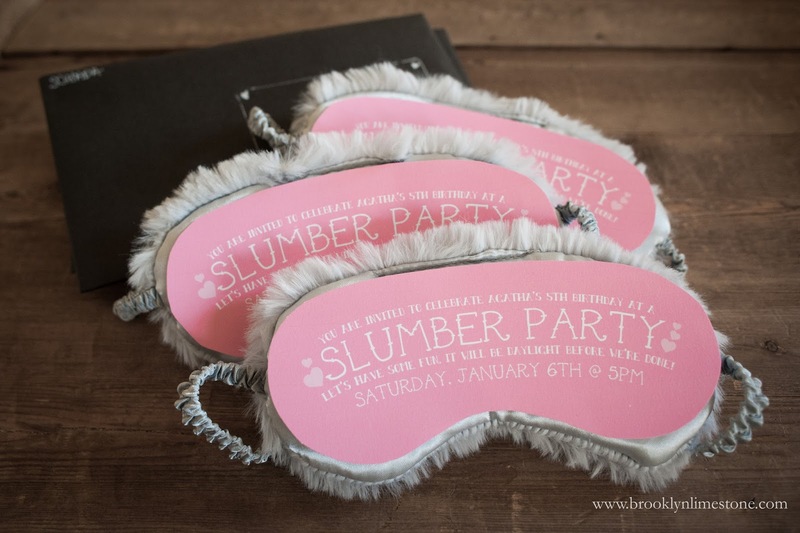 I did do slumber parties when my kids got much older (11-12) and were beyond the "party" phase. 1. 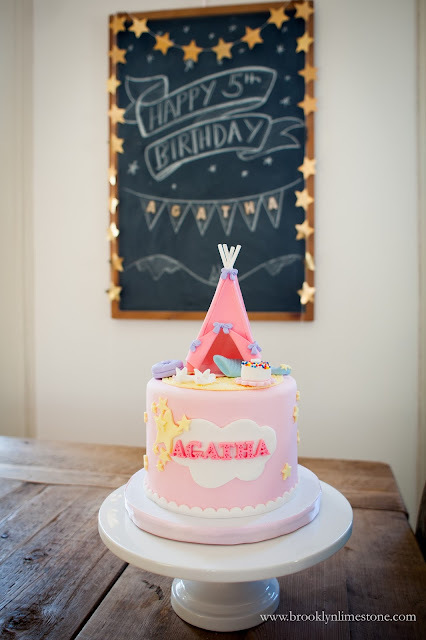 Invite as many guests as age of birthday child. 2. Have party in mid afternoon for 1.5 hours (1-2:30, 2-3:30) so there is no need for a meal. I once had a party for 2 hours and THIS WAS TOO LONG!! 3. As guests arrive have birthday child open presents. 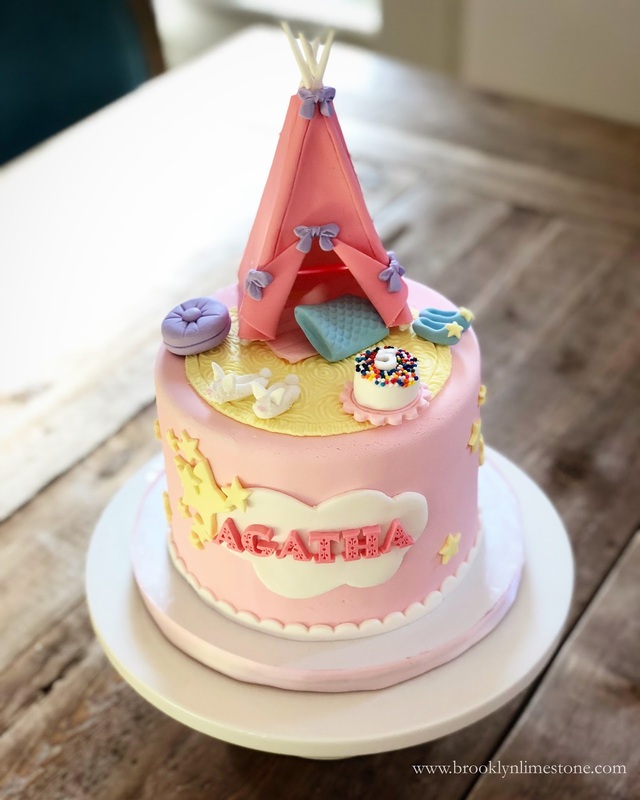 This is very fun and exciting for birthday child and other children are entertained - guest kids also just like seeing other kids houses. Kids never arrive all at once, and generaly trickle in so this can take 15-20 min. 4. Have an official activity for 40-45 min. A game, a video, wii or xbox when they are older. 5. It is now about an hour into the partuy - time for cake and ice cream! 6. I always ended with a piniata (if you puy the right kind they are reusable). Kids love doing this and I generally filled them with candy, candy, candy as well as small age appropriate small things including things my kids got from other parties that they never touched (pencils, stickers, erasers etc). 7. Each kid got a special decorated bag to use for thier piniata goodies and this served as a "favor". Actually as I am typing this I realize that the "activity" could be to decorate the bag! 8. 1.5 hours are up and time to go home! Note: I often saved my own kids favors from birthday parties by putting them in the glove compartment when the got in the car (if they did not seem to really care abou them). Then I would take them into a restaurant where they helped pass the time while waiting for food! 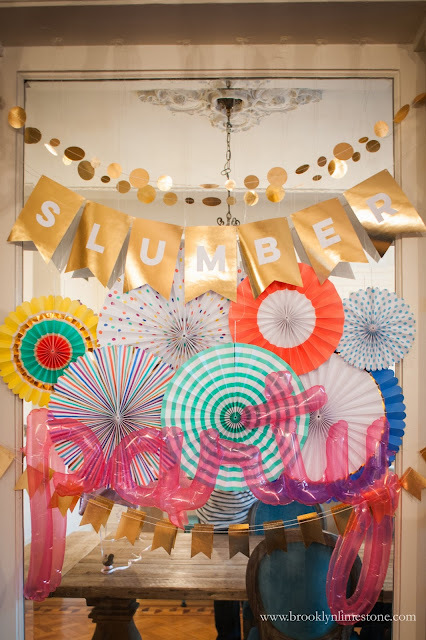 I wish there were a club like Slumber in my city! What a cute party. Love the activities you organized and Aggie looks like she was thrilled. Now if you could only get the kids off to bed that easily every night! Only you could make me want a mermaid pillow! Amazing job, as always.... you have such a gift for getting everything just right! 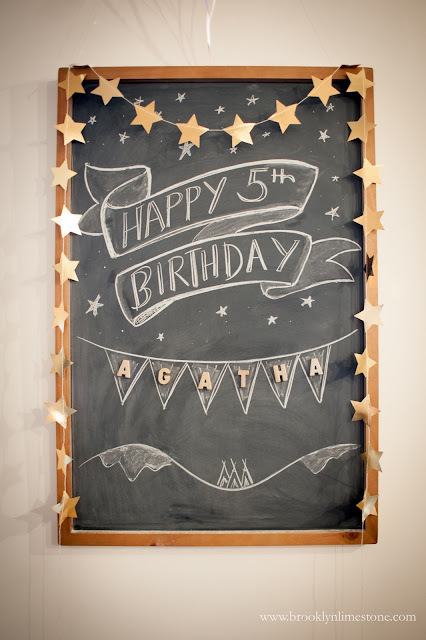 Is Aggie really 5 years old?! This is AMAZING! The balloons and paper in the doorway are so fun. Happy birthday, Aggie!